Toward the end of a brilliant career in 1954, Albert Einstein (Paul Soles) was arguably as famous a media figure as he was a scholar and physicist at Princeton University. It is hard to imagine a more likely pair than the wild haired academic and young Lannie (Lataye Studwood), a twelve year old African-American girl, whose mother works on the university cooking and cleaning staff. In Lannie, Albert is reminded of his own early struggles in Switzerland, his quest for intellectual freedom and his growing concern for the future of democracy in his adopted America. Her youth and earnestness renews Albert’s spirit and in return Albert gives Lannie an incredible gift: an awareness of her potential. The year is 1954. The first of 50 interwoven scenes opens on a spring day at a New Jersey elementary school. As she cleans the blackboard, nine-year-old Lannie Willis, the only black student in an all-white class, learns from her prim, disapproving "whiter-than-white" teacher, Miss Fitch, that she has done badly on her latest test. Meanwhile, on the Princeton University campus, the great Albert Einstein is wrapping up his own lecture to a reverential half-dozen students, Ph.D.s all. His devoted secretary, Helen Dukas, arrives to reminds him of his next obligation, a radio interview in New York that evening. But first, he must grab a quick--though tediously healthy--dinner in the dining hall. A dejected Lannie trudges through working-class Princeton to meet her father, Clifton Willis, at the Baptist church where he has been conducting the choir. Clifton is supposed to supervise his daughter for the rest of the day--but he has other plans. An aspiring jazz singer, he has landed a gig that night in nearby Trenton and intends to drop Lannie off at her mother’s place of work. She shares with her father her disappointing test results, and he tries to cheer her up with a bag of jelly beans. Both of them are clearly nervous about Perla Willis’ upcoming reaction to his plans and her school marks. Indeed, at the university dining hall, Perla is incensed when she learns that she has to babysit Lannie as well as toil over a hot steam table. She dispatches her daughter to the quadrangle and gets back to work. It is obviously not a pleasant job--particularly when two young white students start making unmistakably racist comments. Meanwhile, Einstein encounters his friend and colleague, Dr. J. Robert Oppenheimer, who announces that he has been ordered to Washington to answer questions related to Senator McCarthy’s Committee on Un-American Activities. Einstein is distraught: "These are troubled times for all thinking people," he says, his meal spoiled. Alone in the quad, Lannie is trying to complete her math homework. Not content with taunting Perla, the two students now start to pick on her. Einstein intervenes, dismisses them and introduces himself to Lannie. Soon he is gently encouraging her to rethink her work. He pretends to be doing so in return for a forbidden candy, but his genuine delight in the workings of a young mind is transparently obvious. Perla arrives to whisk Lannie home at the same time that Dukas arrives to hustle Einstein off to New York. The women are unaware that a tentative meeting of minds has been sparked between man and child. At home, Perla reads Lannie the riot act about doing better at school, then takes a bus, daughter in tow, to the nightclub and reads her husband the riot act about pulling his weight as a father and a breadwinner. Clifton digs in his heels. In his Mercer Street study, Einstein frets aloud to Dukas about the storm clouds gathering over his friend Oppenheimer--indeed, over all free thinkers. On campus the next day, he is delighted when he meets Lannie again. With a ruminative story and a compass in his hand, Einstein begins to excite Lannie’s imagination about the wonders of the universe. But at home again, she comes down to earth as Perla announces that another baby is on the way. 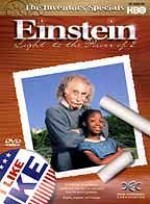 For all of Einstein’s encouragement, Lannie still faces an uphill battle at school. She must come up with a great idea for the science fair, or Miss Fitch will demote her to the remedial class. Lannie goes to the great mans house, intending to ask for assistance, only to be drawn again into one of Einstein’s mesmerizing scientific anecdotes. They go for a long walk. As he explains his groundbreaking formula, E=MC-squared, she feels simultaneously excited and puzzled. Yet she clearly understands his most important point: "The true wonder of learning is in discovering for oneself." In time, Einstein, Dukas and the Willises find sufficient common ground as to feel comfortable on a picnic together. In a rowboat on a pond, Einstein intrigues father and daughter with his ideas about the possibility of universal harmony. At the same time, Dukas and Perla share their thoughts on why this old European Jewish immigrant has taken such an interest in this little African-American girl. The days gentle mood is shattered, though, when Einstein returns home to learn that Oppenheimer has been accused of being a Communist. The great man realizes that he must now make a public stand, once and for all, in the name of intellectual freedom. As Clifton pursues his dream at the nightclub and Lannie buckles down at school, Perla seeks out Miss Fitch to clarify her daughter’s chances for the education she herself was never able to have. But Miss Fitch is cleverly evasive. Perla demands to see the remedial class, and is angered--but not surprised--to see that it is an all-black class. Perla is resolved that Lannie will pass her year despite Miss Fitch. Worn to a frazzle, she then explodes when Clifton announces that his band will be touring, periodically leaving Perla alone. She demands a "time out" and tells Clifton to leave now. He sees that she is serious and complies. Distraught, Lannie seeks solace at Einsteins house, but Dukas the Gatekeeper shooes her away. After a musical montage underscoring everyones sense of distress, Einstein exhorts Lannie to remain true to herself, although Perla still insists he is being unrealistic. And she has good reason to believe that some people are destined to be lifes victims: Clifton is roughed up and arrested by the police simply because he is black. When he insists on performing even while recuperating, Perla relents, appreciating that his dream must not be thwarted, least of all by her. And Dukas, desperate to distract Einstein from his concerns, drags him off to Lannie’s school. There, to his delight--and Miss Fitch’s consternation--Lannie delivers an A-plus oral report on light, and how it is comprised of all the colors of the spectrum. Lannie has done all the work herself--and Einstein reminds her that this is so. As a reward and a token of their love, Clifton and Willis give their daughter a compass just like Einstein’s--a symbol of everyones need to find and follow ones own true direction in life. Albert Einstein--in the minds of many people the most important scientist of all time, indisputably of the modern era--was born in the ancient German city of Ulm on March 14, 1879. His father was a struggling businessman who soon moved the family to Munich and later to Italy. As a toddler, Albert’s slow development worried his parents; he didnt speak until the age of three, and even thereafter manifested shyness and a penchant for solitary pursuits. Although the Einsteins were Jewish, young Albert was until the age of nine educated at a Catholic school that was strict even by the prevailing standards of the day; the experience left him with a lifelong hatred of regimentation (in thoughts, words and deeds) and a deep distrust of authority figures. As a student, though, he eventually began to come into his own, exhibiting remarkable adeptness at problem-solving exercises, and by the time he attended the Swiss Cantonal School in Arrau in 1895 he had confidently set his sights on becoming a theoretical physicist. The next 15 years or so represented a productive and happy time for Einstein on both the personal and professional fronts. He simultaneously studied and taught at the Zurich polytechnical school, tutored for a while, became a Swiss citizen and in 1902 accepted a job as an examiner of patents at the Berne patent office; the position, in which he stayed for seven years, stimulated him intellectually and yet left him time for his own quantum-theory research, and it was a period he always looked back upon fondly. In 1903, he married Mileva Maric, with whom he went on to have two sons, Hans Albert and Eduard. During this time, Einstein earned his Ph.D. at the University of Zurich and began to publish the first of his significant papers. By 1912, a full professor at his old polytechnic, he was enjoying widespread acceptance of his theory of relativity. Membership at academies of science throughout Europe naturally soon followed, and his most famous honor, the 1921 Nobel Prize for physics, cemented his position as Europe’s pre-eminent scientist. On the domestic side, however, he and Mileva had divorced in 1919; Einstein was immediately remarried to his cousin, Elsa Lowenthal, whose daughters he adopted. And Einstein had suffered his first debilitating bout of stomach ulcers, which forced him onto a detested bland diet for the rest of his life. But true storm clouds were building. Einstein had been a vocal pacifist during World War One, and now, as the hand of fascism began to make itself felt, the Jewish genius and a devout Zionist knew that his days in Europe were numbered. As Germany slid into a Depression and Hitler leapfrogged to power, the Einsteins applied for visas to America. Seizing the moment, the Institute for Advanced Study in Princeton, New Jersey, offered him a life appointment. Einstein accepted and left Germany forever in 1933. Einstein’s residency at 112 Mercer Street and his tenure at the Institute provides the real-life setting of Einstein: Light to the Power of Two. Interestingly, the story of his relationship with a young girl who asked him to help her with her arithmetic--offering candy as a bribe--has become an oft-told tale with many variations, but such was the case. (The girl’s name was Adelaide Delong.) Einstein always had a soft spot for children, whose innocence and wide-eyed fascination with life reminded him of his own early attempts to make sense of the world; he also empathized with children forced to endure the strictures of school, with all its rules and regulations. By contrast, to be sure, the behavior of the adult world frequently appalled him. In the early 1930s, narrow-minded American organizations had tried to block his own entry into the U.S.--on the pretext that if he was anti-fascist he must, in turn, be a Communist--and it was with horror and disgust that he then watched his adopted country submit to the anti-intellectual madness of the McCarthy hearings, which swept up the likes of his friend and colleague, J. Robert Oppenheimer. A refugee himself, he was inordinately sensitive to oppressed minorities everywhere--and didn’t have to look far to find a focus for his concerns on the eve of the American civil rights movement. (This preoccupation, and the real existence of Adelaide Delong, encouraged the film’s producers and screenwriter to make their youthful protagonist an African-American child.) Last but not least, the militarization of science and the subordination of civil rights and human values to political considerations and so-called "national interest" distressed him without end. Widowed in 1936, Einstein remained in Princeton when not traveling to speak at selected venues or reluctantly accept awards--knowing, and he was correct, that the world would beat a path to his door whenever it wanted his opinion. His faithful secretary, Helen Dukas, who assumed housekeeping duties after Elsa’s death, did her best to guard his privacy. On April 18, 1955, Albert Einstein died at 112 Mercer Street. He was cremated and his ashes were spread at an undisclosed location. His 76-year-old brain was, as he requested, left to science.